Electronic Journal of Knowledge Management Volume 8 Issue 1, 2010 (1 - 10) Tsang and Zabra, (2008) noted, the age of an organization often gives rise to ossified routines in organizational memory. 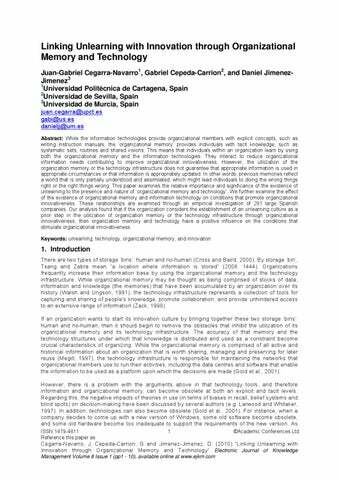 The renewal of organizational memory or the technology infrastructure requires what Akgün et al. (2007) refer to as the ‘unlearning context,’ that is, the context through which the management supports the proactive questions of existing assumptions and beliefs potentially leading to being ignored, modified, deleted or replaced. In this paper we propose that the result of this unlearning context will be the updated information stored in the organizational memory and shared by using technologies. Thus, this study aims to examine the impact of an organization’s ‘unlearning context’ on the challenging of basic beliefs or processes that are explicitly or tacitly represented in organizational memory and technology systems. We also examine the effect of the existence of organizational memory and information technology on conditions that promote organizational innovativeness. In the following we examine the concepts discussed above and explore potential relationships between them. The examination of lens fitting, which refers to an interruption of the employees' habitual, comfortable state of being, and it is through such framework that individuals of an organization will have access to new perceptions. The framework for changing the individual habits, which refers to the challenge of inhibiting wrong habits when an individual has not only understood the new idea, but is quite motivated to make the change. The framework for consolidating the emergent understandings, which refers to the organizational process that can free employees up to apply their talents by implementing new mental models based on adaptation to new knowledge structures. Electronic Journal of Knowledge Management Volume 8 Issue 1, 2010 (1 - 10) model is evaluated by examining the R2 values and the size of the structural path coefficients. The stability of the estimates is examined by using the t-statistics obtained from a bootstrap test with 500 resamples. Figure 1 sets out the model statistics and the path coefficients with the level of significance achieved from the bootstrap test. Consistent with hypotheses 1 and 2, the paths between Unlearning context and Technology infrastructure (β=0.598, p<0.001) and Organizational memory (β=0.236, p<0.001) indicate positive and significant relationships among them (see Figure 1). Additionally, hypotheses 3 and 4 are supported because the two path driven to innovativeness, from technology infrastructure (β=0.493, p<0.001) and from organizational memory (β=0.184, p<0.01) are also positive and significant. What means the propensity to innovate is influenced by the technology infrastructure and the organizational memory. Finally, we performed the Stone-Geisser test of predictive relevance to assess model fit in PLS analysis (Chin, 1998). When q-square is greater than zero, the model has predictive relevance. In our model, q-square was 0.11. Regarding the effect of Technology infrastructure and Organizational memory on innovativeness, the results further suggest that the effect associated with the technology infrastructure is stronger than the effect associated with the organizational memory. Juan-Gabriel Cegarra-Navarro, et al. information and knowledge”. It means that through the unlearning context, organizations foster a capacity where teams and their members are continuously able to increase their abilities to articulate knowledge and use technology tools. With regard to H3 and H4, our findings suggest that organizational innovativeness is driven by the utilization of technology and the exploitation of what has already been learned and stored into the organizational memory. The results further suggest that the effect associated with the technology infrastructure is stronger than the effect associated with the organizational memory. This result is worthy of further investigation. One conclusion that might be drawn from this result is that people usually take advantage of technologies after colleagues direct them to a specific location in a system for lessons or tools (Gold et al., 2001). The study is not without limitations. Firstly, although in this paper, we have structured the process flow only in one direction from the unlearning context to the innovativeness, we think that there are different ways of unlearning. Under this framework, while unlearning and innovativeness could be parallel processes in a specific context, in another context the same process flow should consider unlearning as a prior step. Secondly, in the same way that each person tries to invent his or her own memorization techniques, each organization will have basic ideas on which are the capacities of each one, a circumstance which is going to facilitate the unlearning of outdated knowledge. This means that other factors, which have not been included in this study, might also affect the constructs and relationships between them. In fact, some common problems for each company would be established, which are seen and used differently by each one of them. 6. Conclusions Based on the above arguments, the main contribution of this research is to question the existing models which relate organizational memory, technology infrastructure and organizational innovativeness. In this paper, we warn companies about the cost of outdated technology infrastructures and knowledge stored in organizational memory. Although organizational memory and technology infrastructure potentially facilitates information sharing and joint sense making if organizational memory is not updated appropriately individual learning is likely to suffer causing a reduction in the value of knowledge. Regarding this, it is often stated that firms more often converge rather than reorient, because of factors such as organizational inertia. A possible explanation for that inertia may relate to outdated memories, which can affect the learning of an individual by: narrowing the cognitive processes of individuals; hindering their ability to plan, reason and understand the situation effectively; fostering a sense of the inadequacy of linkages between variables, such as people and processes; and limiting individual’s prior knowledge of the potential interactions between new processes and their consequences. This means that individuals come to rely on embedded knowledge and reduce their participation in spontaneous interactions with their colleagues. Thus individuals become less creative and they allow individual relationships to become ‘fixed’ and unresponsive thus potentially reducing the value of new knowledge. Therefore, when an existing stock of knowledge has already been stored by an organization, but appears counter-intuitive or deeply flawed, this current “stock” should be ignored or at least set aside temporarily if we wish to give a new idea or interpretation fair consideration. Otherwise, individuals will experience fear, pressure and uncertainty and will feel confused at the prospect of unlearning an old habit and implementing a new one, which could hinder the learning process. References Akgün, A.E., Byrne, J.C., Lynn, G.S. & Keskin, H. (2007) “Organizational unlearning as changes in beliefs and routines in organizations”. Journal of Organizational Change Management, Vol 20, No.6, pp. 794-812. Bettis, R.A. & Prahalad, C.K. (1995) “The dominant logic: Retrospective and extension”, Strategic Management Journal, Vol 16, No. 1, pp. 5-14. Bogenrieder, I. (2002) “Social architecture as a prerequisite for organizational learning”, Management Learning, Vol 33, No. 2, pp. 197-216. Carmines, E.G. & Zeller, R.A. (1979) Reliability and validity assessment. London: Sage. Cegarra, J.G. & Sanchez, M. (2008) “Linking the individual forgetting context with customer capital from a seller’s perspective”, Journal of the Operational Research Society, Vol 59, No. 12, pp. 1614-1623. Chang, D.R. & Cho, H. (2008) “Organizational memory influences new product success”, Journal of Business Research, Vol 61, No. 1, pp. 13-23. Chin, W.W. (1998) The partial least squares approach to structural equation modeling. G. A. Marcoulides, Ed. Mahwah, NJ: Lawrence Erlbaum Associate. Christensen, C.M. & Rosenbloom, R.S. (1995) “Explaining the attacker's advantage: Technological paradigms, organizational dynamics, and the value network”, Research Policy, Vol 24, No. 2, pp. 233-257. Cross, R. & Baird, L. (2000) “Technology is not enough: improving performance by building organizational memory”, Sloan Management Review, Vol 41, No. 3, pp. 69-78. Damanpour, F. & Gopalakrishnan, S. (1998) “Theories of organizational structure and innovation adoption: The role of environmental change”, Journal of Engineering and Technology Management, Vol 15, No. 1, pp. 124. Day, G.S. & Nedungadi, P. (1994) “Managerial representations of competitive advantage”, Journal of Marketing, Vol 58, No. 2, pp. 31-44. Dewar, R.D. & Dutton, J.E. (1986) “The adoption of radical and incremental innovations: An empirical analysis”, Management Science, Vol 32 No. 11, pp. 1422-1433. Juan-Gabriel Cegarra-Navarro, et al. Diamantopoulos, A. & Winklhofer, H. (2001) “Index construction with formative indicators: An alternative to scale development”, Journal of Marketing Research, Vol.37, No 2, pp. 269–277. Fornell, C. & Larcker, D.F. (1981) “Evaluating structural equation models with unobservable variables and measurement error”, Journal of Marketing Research, Vol.27, No. 1, pp. 39-50. Gold, A.H., Malhotra, A. & Segars, A.H. (2001) “Knowledge management: An organizational capabilities perspective”, Journal of Management Information Systems, Vol 18, No. 5, pp. 185–214. Huber, G.P. (1996) Organizational learning: The contributing processes and the literature. Organizational Learning, M.D. Cohen and L.S. Sproull, Eds. Thousand Oaks, CA: Sage. Hulland, J. (1999) “Use of partial least squares (PLS) in strategic management research: A review of four recent studies”, Strategic Management Journal, Vol 20, No. 2, pp. 195– 204. Hurley, R.E. & Hult, G.T.M. (1998) “Innovation, market orientation and organizational learning: An integration and empirical examination”, Journal of Marketing, Vol 62, No. 3, pp. 42-54. Larwood, L. & Whitaker, W. (1997) “Managerial myopia: Self-serving biases in organizational planning”, Journal of Applied Psychology, Vol 62, No. 2, 194-198. March, J.G. (1972) “Model bias in social action”, Review of Educational Research, Vol 42, No. 4, pp. 413-429. Mathieson, K., Peacock, E. & Chin, W.W. (2001) “Extending the technology acceptance model: The influence of perceived user resources”, The Data Base for Advances in Information Systems, Vol 32, No. 3, pp. 86-112. Megill, K.A. (1997) The corporate memory. Information management in the Electronic Age. London: Bowker & Saur. Menon, A., Bharadwaj, S.G. & Howell, R. (1996) “The quality and effectiveness of marketing strategy: Effects of functional and dysfunctional conflict in intra-organizational relationships”, Journal of the Academy of Marketing Science, Vol 24, No. 4, pp. 299-313. Nunnally, J.C. (1978) Psychometric theory. New York: McGraw-Hill. Nystrom, P.C. & Starbuck, W.H. (1984) “To avoid organizational crises, unlearn”, Organizational Dynamics, Vol 12, No. 4, pp. 53-65. Schein, E.H. (1992) Organizational culture and leadership, San Francisco: Jossey-Bass. Shaw, R.B. & Perkins, D.N. (1991) “Teaching organizations to learn”, Organization Development Journal, Vol 9, No. 4, pp. 1-12. Sinkula, J.M., Baker, W.E. & Noordewier, T. (1997) “A framework for market-based organizational learning: Linking values, knowledge and behaviour”, Journal of the Academy of Marketing Science, Vol 25, No 4, 305-318. Tsang, E. & Zabra, S. (2008) “Organizational unlearning”, Human Relations, Vol 61, No. 10, pp. 1435-1462. Walsh, J.P. & Dewar, R.D. (1987) “Formalization and the organizational life cycle”, Journal of Management Studies, Vol 24, No. 3, pp. 216-231. Walsh, J.P. & Ungson, G.R. (1991) “Organizational memory”, Academy of Management Review, Vol 16, No. 1,pp. 57-91. Wang, C.L. & Ahmed, P.K. 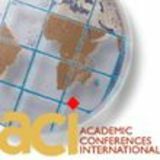 (2004) “The development and validation of the organisational innovativeness construct using confirmatory factor analysis”, European Journal of Innovation Management, Vol 7, No. 4, pp. 303-131. Zack, M.H. (1998) “An MIS Course Integrating Information Technology and Organizational Issues”, Data Base, Vol. 29, No. 2, pp. 73-87. Zuboff, S. (1988) In the age of the smart machine. New York: Basic Books.